Over the last several months I’ve been using printable calendars in several different ways in my classroom and at home. I went to download January in anticipation of the new month (I’m on top of my game by 2 days, shocking!) and decided to just create my own. I wanted something in black and white so it’s easy on my printer. The one I had been using had some colors in it, and I just didn’t need it to be. Plus, this way I can easy print them at work and not have to travel across the building for the color printer. I am generally not a fan when something prints in black when it’s colored as the toner makes it look light and discolored. I thought I’d share them here with you with some ideas on how I use them in my room. My students have binders that we use to house our frequently needed documents. Morning work and story problems are stored in the binder and are copied every month or so. We also keep poems in binders that we’ll go over when we have some time throughout the day. My kids keep their printable calendars one month at a time at the front of their binder so they always know where to find it. Students can record the title of the book they read that day, or the number of pages that were read in a chapter book. This can be helpful if you ask for a reading log for homework or during SSR time in the classroom. Because we do AR in my school, I have my students use the printable calendars to record the score they earned on their AR test. It helps them self-monitor their scores and testing frequency. If you do a choice-based centers system where you want students to have the freedom to choose which centers they work through, but still want them to work through a variety, an open calendar may be helpful for having students indicate which center they went to on which date. I have students come in during breakfast and recess time to get additional minutes on our mandated online programs. I then use the printable calendars to record which students came in on which date so later I can quickly and easily find approximately how many additional minutes of instruction a specific child received. I’m still such a paper-oriented data person and like to store this in my data binder. You could also use this as a recording tool during one-on-one or small group intervention time to indicate a student’s progress monitoring score, their attendance, or the skill covered during the group. One of the things I try to instill in my students is personal responsibility. As a third grade teacher, I expected my students to know where they were at with virtually any part of our day: their goals, what they were working on, what expectations were, etc. As a first grade teacher it doesn’t look quite the same in my classroom, but is still something we’re working through during all parts of our day. My first graders can and do fill in their personal calendar with what I’ve asked them to. They need to be shown how and monitored closely in the beginning, but once they get into the routine, they’re able to do it independently. That means calendars can be used with virtually any aged student as a means for that student to monitor themselves and be accountable. An open month-long calendar is great for having students record that they completed a task, a score on a task, or that they worked through a task. It’s a great visual tool that students can use independently to monitor whatever it is he/she is working on. 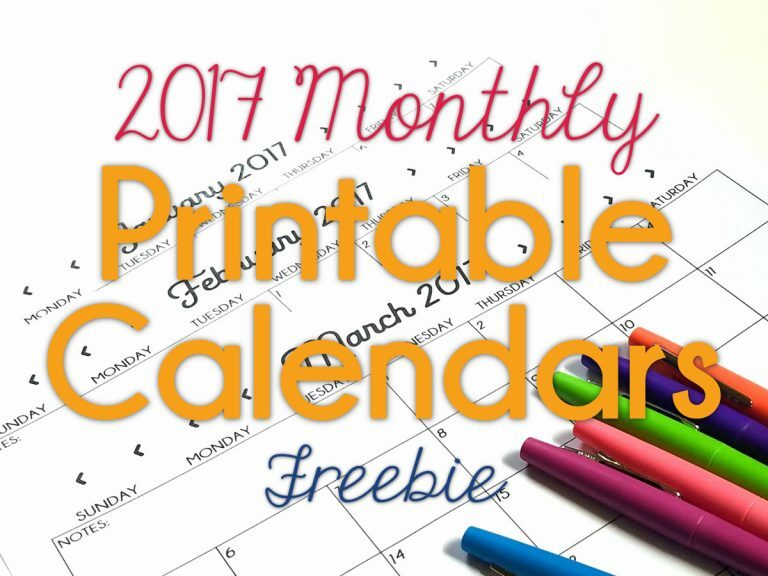 To download the free 2017 monthly printable calendars for yourself, just click here or on the image below. You can find and download my 2018 Calendars here and the 2019 Calendars here. Thank you so much. It sounds silly but I struggle with making a calendar format every single year. I also use a calendar for my classroom volunteers. can you post for 2018, too? This is a great template!! I love this set up-especially with the extra area for “notes”. I send this home with my preschoolers for show and tell, field trips, etc and the note section is great for filling in extra info, especially for the field trips. Do you have 2018??? Yes, I will be making a set for 2018 soon! Love this calendar! Could you post a 2018 one? I’ll be posting a 2018 version soon! Do you plan on making a 2018 calendar? Yes, I’ll be making a 2018 soon! I would also love this template for 2018!